As 2014 is coming to an end it is time to think about what are the trends for 2015 in interior design. I love looking at trends and I am very excited to see what is becoming popular in residential design for 2015. Most trends start in fashion & transition into interior design. Below are a few trends I am seeing used more and more in commercial and residential design. Beige is dead! White, Gray, and Black are the go to neutrals. The use of beige has been over used for years and it is now tired and it is time for the cooler neutrals to be on top. It does typically take 10-15 years for color trends to move from warm to cool neutrals. (cold grays in the 80's and then the move to beige in the 90's and then to taupe in the 00's). We are now in the middle of the 10's and gray is huge! I have also seen a big white trend that started a few years ago when apple products dominated our lives. White trim and other white accents have been a simple and sophisticated way to update your space. I use white in commercial and residential design and it really has replaced the old school beige. The use of gray walls and accents in metals have been gaining ground the last few years. Gray & Charcoal have been replacing the chocolate browns of the last 10 years. I have started to use it more in more in my current projects and I love the cooler neutral with the white accents and it brings any wood color to life! If you are looking for a simple way to freshen up your land of beige, paint it gray instead and it will look amazing! The most current trend I have been seeing pop up in 2014. It is used in trim, accents and metal details. It is a wonderful way to add richness and a more masculine touch to a space. The dark strong use of black creates an amazing contracts to white and the warm wood tones which is being used more and more. Also the growing rustic trend is bringing black back. The last few years, more and more people are using rustic, reclaimed and vintage wood in their design. I first used it in 2012 in my Toronto office project and then in my house in 2013 and I keep seeing it more and more. I love the use of a more rustic wood used in spaces since it creates a more cozy and rich space. Any wood type works and it is more about the texture of the wood. As we have been seeing gold back in fashion it is also slowly coming back used in small accents in interior design. I don't think we are ready for the full on brass as we saw in the 80's but simple gold accents in fixtures, lighting and decor are a wonderful way to freshen up your space. Gold accents look most current when used with white, rustic woods and black. I would watch out by using them with the honey oak of the 80's since that will not look current and just look dated. Another trend I am seeing is the use of textured wall paper. I used to hate wallpaper since it brought back many memories of 80's/90's wallpaper but the new use of texture on walls is great. It is an easy way to add more warm and your own personality into a space. 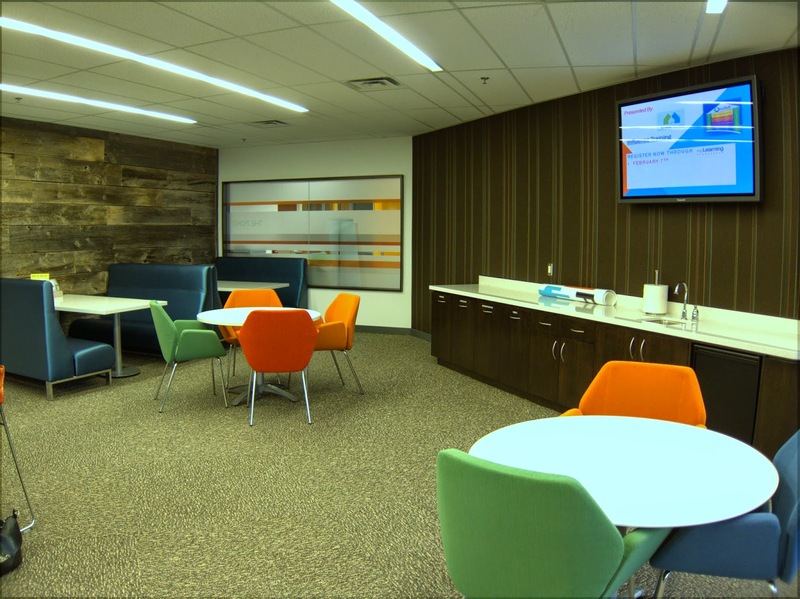 I use fabric and wood panel walls in commercial design to create this look. In residential design, I am seeing rustic wall panels used and so many wonderful nature or geometric patterns in the wallpapers. I am thinking of using a textured wallpaper or wood wall pattern in my own home at some point. There are so many different options out there so find what speaks to you best and what works with your space and design aesthetic. One of the big trends fashion this spring of 2015 is the use of pastel colors. I have been seeing it used more and more in interior design. It has been done well in a more country style but the use of pastel mint or blue have been working well in modern design. Use it with white and gray and in small amounts to freshen up a space. In the last few years, the price of large flat screen TVs have dropped a ton and the more integrated living room is killing the home theater trend. Projectors are now more expensive and less flexible than large TVs and the dedicated space for just watching movies or sports is not as popular. I am seeing the want for a larger main TV at the heart of the home is becoming more desired which creates more flexible for families as they grow, age, and change. Also the more integrated technology in our homes is making it more important to have a flexible space for watching TV, using apps, and other sharing of information on our mobile devices. What trend are you going to try in 2015? As September is coming to a close and fall is in the air you might be wondering how can I take the 1400+ pages from Vogue & InStyle and apply it to my fall 2014 wardrobe? You might also notice that there is lots of leather, faux fir and metal used in fall fashion this year. It looks like the models are extras out of Game of Thrones. Here is a recap of what I saw and items you can afford in the stores. The biggest trend this fall is leather, leather, leather. I have seen it in jackets, skinny pants, skirts, tops, dresses and more. I have also seen it in black, rust, navy and many other colors. I highly recommending investing in one new piece with leather or fake leather this fall. Piperlime and BR , & J Crew have the best variety of options right now. Another big trend I have seen is quilted. I have seen it in skirts, vests, purses, and outerwear. I love the texture and I bought the quilted faux leather skirt from Banana Republic since it hits two trends at once. This fall sports or lounge wear is HUGE! It is even reported that denim sales are down for the first time in years due to lounge yoga pants & leggings! I love this more causal twist to fall fashion. I also have embraced wearing my metallic van sneakers to work with a skirt. It is a fun why to freshen up your current wardrobe and be comfortable. I love houndstooth and I think this classic print never goes out of style. I highly recommend picking up something in houdstooth. I have a skirt but I love adding it in small amounts like accessories. You see it a lot at J Crew, BR, and Ann Taylor right now. Mixing metallic is huge but gold is the big metal used in everything. Move over silver and gunmetal since gold is back. It is used a lot with black, clear or pearls which adds a little edge to a classic piece. You will also see smaller necklaces instead of the large chunky ones of past seasons. BR, JCrew, & Ann Taylor have some great options. Don't forget to also shop at J Crew Factory as well. The clothes and accessories are cheaper and great quality. I love animal print the new print I have seen used the most is leopard or cheetah. Great in small amounts and always in style. Ann Taylor has lots of options for sale now. I love skirts and the newest length which is mid-length is a nice change for fall. It works great with heels, boots or oxfords. I have found Piperlime and JCrew have some of my favorites in both leather and wool texture. I know I have been enjoying adding a few pieces here or there in my wardrobe to freshen things up for fall. Share with me what new trends you are going to give a try. Below are some of my favorite fall items I would recommend trying! Wondering what to wear on a raining weekend in the city? Try mixing a hounds-tooth trench coat and umbrella with my favorite boyfriend jeans and wellington boots from JCrew. Also add a pop of deep wine in your accessories to which is one of my go to fall colors. It is that time of year again when we freshen up our wardrobe with the current fall trends. This year's color report from Pantone uses atypical colors which you don't typically see in past fall pallets. The fall color trends are more artful, feminine and unexpected. The red is deep with a dark pink mixed in and the use of a light and darker orchid makes the fall colors very atypical. The green has shifted to a more military cypress green which is very rick and powerful. The neutrals this fall are royal blue which is very strong and more exciting than your traditional navy. There is lighter grey Aluminum and a medium brown cognac which is one of your typical fall colors. One of my favorite is the unexpected pop of Misted yellow in the fall pallet. It brings energy and richness to the other colors. Below is the report from Pantone. Prominent colors: Cypress, Misted Yellow and Cognac are my prominent colors I will try this fall. I have also bought some royal blue items to freshen up my neutrals for fall. Inspirations: I am inspired by military colors and patterns this fall. I love the new greens, cognac and camo prints used in shoes, accessories and shirts. Must have item for fall: Cognac ankle boots which will work great with jeans, pants and skirts. Cognac will also go with grey, black, navy, and tan pants/skirts. What is your favorite new fall color for 2014? Many people have disorganized garages (my self included) so I wanted to share some basic tips and products I have used to help clean up and organize a garage space. Summer time is the perfect time to take a few days and tackle this type of project. Below are some simple tips to get yourself organized and to create a plan of attack. Go through EVERYTHING in your garage and organize before you buy a storage solution so you know what you have and what to get keep. Make a pile to keep, donate, trash, or recycle (check your local city information on local recycle sites and hazards waste drop off locations. Take a day or two to really go through your garage first. Do you want open shelving or enclosed? I have found the Rubbermaid fast track system works great for hanging things on the wall vertically and it is not expensive! This system is great for all of the misc yard tools you have. Don't be afraid to bring out the label maker! Label your boxes or bins so it is very clear what is in each thing. Saves time in the end. Have fun with it and include the family! Here is an image showing the use of open shelving, wall organization rails and enclosed storage. This is the Gladiator wall gear system. I find after you take the time to understand what all you have to store you can find the right inexpensive storage solutions at your local home improvement stores. I have practicing commercial interior design for 15 year now and helped many friends and family on residential design projects as well as designing my own home 1 year ago. I have learned a lot of about residential design after building my house and found I used a lot of the same design principles I use in commercial office design. I would like to share with you some of my designing principles that work for commercial and residential design. Please remember that these are ideas I use in design and there are may ways to design interior space. Feel free to use all or a few tips depending on your own style and project. Do your research and really understand what you like and your goals of each project. I recommend using Houzz and Pinterest for getting inspired for your design project. In commercial design, this is the process you do to understand what your clients likes or doesn't like and defining the scope of the project. Don't slip this step and try to do this first since it will create the scope and budget and help you take your time to create a space you (the client) really wants. Use natural colors for the more expense materials in your spaces. They shouldn't be too trendy. 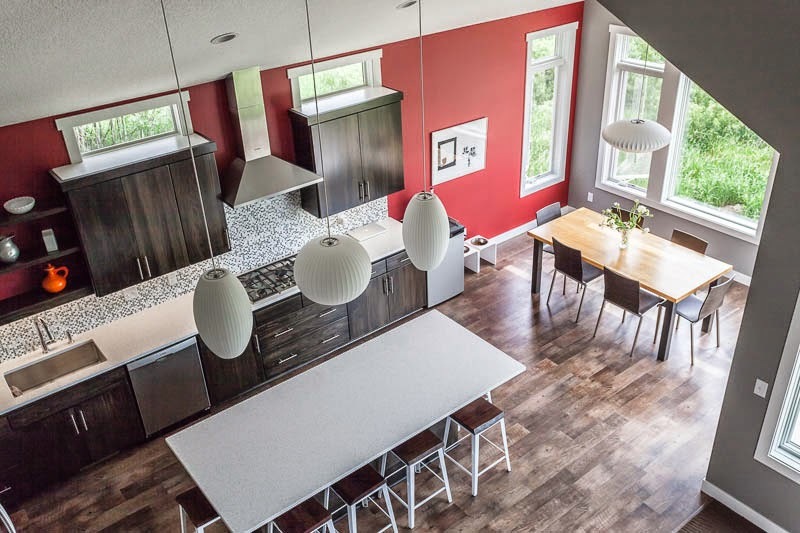 Examples are using barn wood floors or beams, tile, textured quarts or garnet counter tops wood walls or wood ceilings, fabric walls panels, metal ceilings, textured walls, stone or brick on a fireplace, etc. Use color with paint and accessories since they are easy and cheaper to update when the color you used goes out of style. End accent painted walls in an inside corner not an outside corner. It is a cleaner ending point and looks like you thought through where the paint ended instead of forcing the end point. Think about site lines while layout out space and where you want to or don't want to add a window. Think about how you will use the spaces and that will help you decide on where to locate it and what finishes to use. Most important advice I can give is to really take the time to understand what you like, what you don't like, what your project scope, and budget is before planning. Make sure you have clear communication with all trades working on the project with you so your ideas can be executed like you imagined they would. It may not feel like spring will ever arrive but it is time to start thinking about the new spring fashion color trends. This spring brings a wonderful balance of fresh pastel colors and bright colors that work wonderful together. I tend to like brighter colors but I really enjoy this lovely mix of colors in the Pantone 2014 spring color report. Below is a video of Leatrice Eiseman who is the Executive Director of the Pantone Color Institute describing each color. I am most excited to add Hemlock into my spring wardrobe this spring. it is a light fresh green that can go with most colors. My inspiration for this spring is planning for a trip to The Netherlands & Belgium next month. It has been such a snowy cold winter I can't wait to see all of the spring flowers starting to bloom! As many of you might already know, my signature color is orange. I do love the new shade of orange this spring. It is bold but not electric and will freshen any neutral color in your wardrobe. I am looking forward to adding a floral print dress or skirt this spring. Floral prints are very popular this spring and I am really looking forward to any type of flowers this spring. I would use a accent of freesia in a bathroom or bedroom with grey as the neutral. It brings such energy and life to a space and just makes you smile. The Men's spring color pallet is similar to the woman's and have changed out Hemlock to a strong earth green - Comfrey. I had toe surgery two months ago and still can't wear my higher heels so I am very excited about fun options for flats. I also bought a pair of Vans sneakers in metallic gold and I am seeing sneakers worn with skirts and dresses. I will be trying that sporty trend. I also love skirts and fuller skirts are so flattering and have a hint of vintage flair. I am so glad the black & white trend is still going strong since it is so timeless. Leave a comment on what your favorite Pantone spring 2014 color is and your favorite spring fashion trend. What shoes to wear with what color pants?